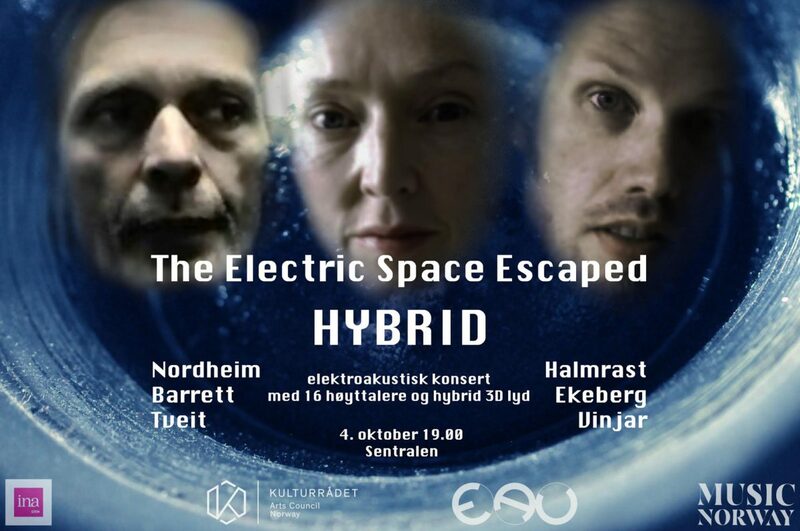 Welcome to ‘The Electric Space Escaped HYBRID’ concert. Acousmatic 3-D electroacoustic music, hybrid ambisonics and sound diffusion performance over 16 loudspeakers. After four successful and intimate events in the Electric Space Series, EAU have launched themselves into a new and larger space central to Oslo. New space, new sound, new size, new music! Sentralen venues will be our concert playground on the 4th October where you can be the first to experience our new program before we perform at GRM (Paris). Program Sentralen P1, Oct. 4th 19:00. Natasha Barrett: He slowly fell and Transformed into the Terrain (24’00, 2016).WP Hybrid 3-D ambisonics. Anders Tveit: Ombre Cinesi II (9’00, 2016).WP. Hybrid 3-D ambisonics. Arne Nordheim: Solitaire (12’00, 1968). New spatialisation. Tor Halmrast: Aqueduct (12’55, 1992). Live, sound diffusion performance. Frank Ekeberg: Intra (12’35,1999). Live, sound diffusion performance. Follow the website for updated information on our diverse program of live and immersive electroacoustic music and live electronics.